Fairy Ring – what it is, where it comes from, and what to do about it. 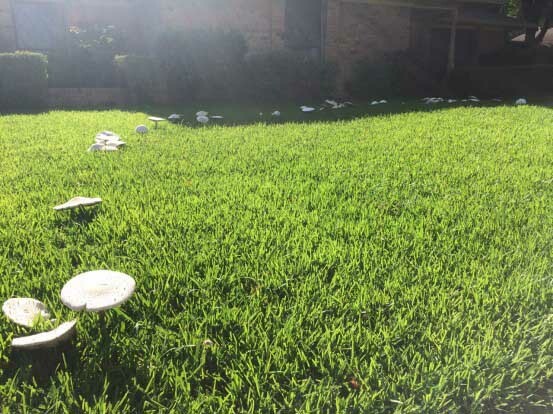 Have you ever noticed an eerily uniform ring of mushrooms in your yard? Or maybe a patch of dead grass that is so perfectly circular that it looks like it could have come out of a scene from the movie Signs? If so, you probably have a fungal disease in your soil called Fairy Ring. The name Fairy Ring comes from a long trail of European folklore. Some say that the rings come up where the fairies danced the night before. Other cultures believe that they are witches circles and humans are not meant to step into them, lest they be punished. There are many variations of the mythical nature of Fairy Rings but science seems to disprove anything s u p e r n a t u r a l going on here. Fairy Ring is a severe fungal disease that can surely disrupt the American dream of having the best and brightest yard on the block. It starts with a spore that is underground – think of the mold that forms on old bread or food. The tiny individual strands are called hyphae and a colony of those silky tubular structures make up what is called the mycelium. As the mycelium grows outward in a circular structure in search of more nutrients, it depletes the soil in its path. This results in a hydrophobic environment meaning that the soil is unable to retain water. Anything that tries to grow there will eventually die due to lack of hydration and nutrients. The dead grass indicates the hydrophobic environment that is left after the Fairy Ring has taken it’s course. Since mycelium is an integral part of the soil food web, Fairy Ring is likely to occur almost anywhere, in the right conditions. Some research has said that this phenomenon is stemmed from decaying wood matter of any kind i.e. tree roots, stumps, construction lumber buried underground. Other research states that it is a result from thatch buildup on the surface of the ground. Either way, not all mycelium creates Fairy Ring but all Fairy Rings stem from mycelium. So what’s the cure, Doc? From our experience we have found no successful cure for this, unfortunately. Since the issue stems from the mycelium, the only true way to eradicate it would be to dig it completely out of the ground. It is nearly impossible to know if you have successfully gotten every tiny bit of this fungus or not. Most people do not seek guidance or solutions until their grass starts dying; so, if you have mushrooms or dark green circles, I wouldn’t fret just yet. If/when it does occur, our recommendations are always geared towards practical solutions. 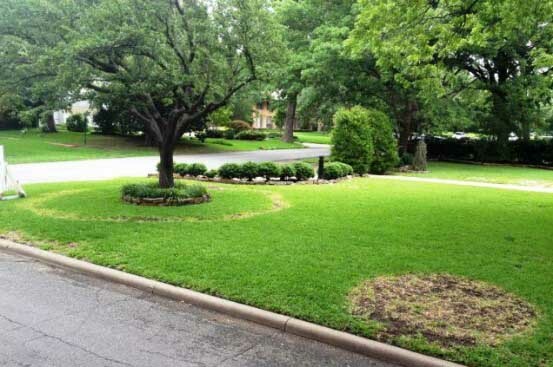 Since resodding and pesticide products can be extremely expensive, the most efficient solution would be to install a large bed where the Fairy Ring is. Depending on your style and aesthetic preferences, there are many different routes you can go in terms of what to put in the beds. We would recommend to stay away from planting much in them though because it is possible that they will also be affected by the Fairy Ring. Perennials may be a good choice since they will die off with the changes of the season. The mushrooms are the fruiting bodies of the mycelium fungi underground. We are a l w a y s happy to answer any questions you may have regarding issues in your landscape. If you think you may have Fairy Ring but need a confirmation, please feel free to email us pictures to info@soilsalive.com. We’re happy to diagnose the issue whether you’re signed up for our program or not!